Author Landing Page is a child theme of Book Landing Page free WordPress theme. This theme features a highly converting landing page to showcase your book and increase its sales. You can create a fully responsive and professional landing page for your book launch using this theme without writing a single line of code. Also, this theme is fully compatible with the popular WooCommerce plugin to allow you to sell your books via your website. You are a writer, an author, an editor, a novelist, a bookstore owner, or a publisher who wants to launch, promote, and sell books online. You are looking for a premium landing page template to launch your book-- ebook or hard-copy book. You want a professional looking website, but you don’t want to write a single line of code. You want a clean, responsive, SEO-friendly, and Speed Optimized landing page website to increase the sales of your book. You don’t want to hire a developer to create a website for you because you neither have the time nor the budget. You want an easy-to-use site that you can customize as per your need. You are a web agency, and your client wants a beautiful and effective website quickly to promote their book. You want free demo content so that you can get started with your project immediately. With smartphones being so popular, more than 50% Google searches are done on mobile devices. So, your website needs to be mobile-friendly. Author Landing Page theme is a fully responsive WordPress Theme that smoothly adapts to every device and screen size so that your visitors get smooth experience every time. Also, mobile-friendliness plays an important role in the SEO of a website, especially after Google started factoring responsiveness to its algorithm. Author Landing Page free theme features an attractive and beautiful landing page design to impress and keep your visitors engaged on your website. It is very important to convince your visitors that the book is for them to convert them into customers. The sales of your book will skyrocket with Author Landing Page free theme. You can kickstart your book launching website with the free demo content of this theme. You can make your website look exactly like the demo website with just one click. One Click Demo Import feature will import text, images, and theme settings and you will potentially save hours of work. Focus on your book; let the free feature handle the website. Author Landing Page free theme allows you to keep a WordPress Default Background Header Image and a post in the banner section. You can add a single image or randomize multiple images. You can also display a call to action button on the banner section to prompt your visitors to take action. Also, there is an option to upload an image of the debit/credit cards your website accepts from the buyers on the banner section. The features section of this theme allows you to display features of your book on the homepage. You can add unique features of the book to impress your visitors and increase the sales of your book. People love reading what others have to say about your business. With Author Landing Page free theme, you can display your satisfied clients' testimonials on the homepage which will be helpful in impressing your new visitors and turn them into customers. You can add the video review of your book in the review section to help your user learn better about your book. You can add a post review in this section for a detailed explanation of your book. It will help to create a positive impression among the visitors about your book. With Author Landing Page free theme, you can add a subscription form on the homepage of your website. The subscription form helps your visitors to sign up for your newsletter and generate new leads for your business. Furthermore, you can convert your subscribers into customers by providing them offers through the newsletters. This theme helps you display information about you and your journey of writing the book in the about section in an organized way. You can run a promotional offer and give certain discounts to your customers using the Promotional section on the homepage of this theme. Research shows that even a second matters when you are selling online. There are instances where online businesses have failed because they had a slow website. On top of the usability, Google has also made speed an important aspect of its ranking algorithm. So, it is critical that you have a website that is super fast! 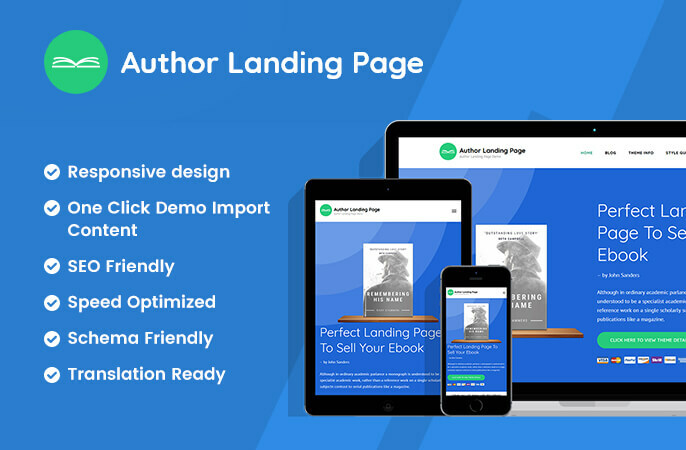 Author Landing Page free theme has performance-optimized codes that will make your website load faster so that you can beat your competitors with ease. Author Landing Page free theme is an SEO friendly theme to help your website climb heights in search engine rankings. This theme is developed by implementing our expert SEO team’s expertise and knowledge so that search engines can easily find your website and rank it above your competitors on the search results page. Search engines love websites that are easy to understand, so we have embedded Author Landing Page free theme with Schema.org markup. Schema.org ready code will help you rank higher in search engines. Author Landing Page free theme comes with easy to use built-in live customizer to help you customize your website with live preview. You can make changes to your website and see its preview without saving it using the live customizer. You can build your dream website within no time using live theme panel. The theme works seamlessly with WooCommerce plugin which means you can start selling your book via your website with Author Landing Page free theme. Author Landing Page free theme is cross-browser compatible, which means the theme will work seamlessly on any browser your visitor is on. 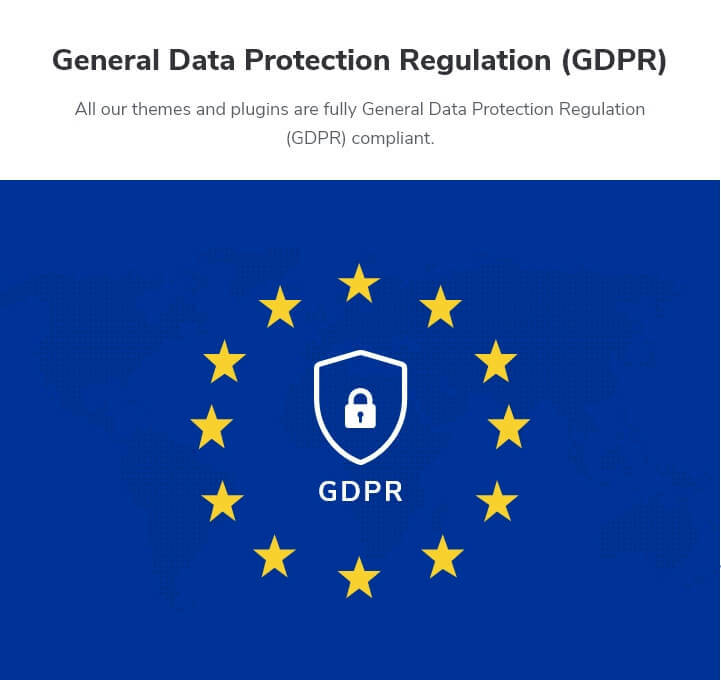 The theme is tested on Chrome, Firefox, Microsoft Edge, and Safari. Author Landing Page free theme has a breadcrumb option that can help your visitors to navigate easily on your website so that there is maximum engagement. If you don’t wish to keep color in the background of your website, you can also put up a beautiful and attractive image. Yes, with Author Landing Page free theme you can also keep an image in the background of your website. Author Landing Page free theme has ample space for widgets on the sidebar if pages other than the homepage. You can add and manage the widgets on the sidebar as per your requirement without compromising the design of the theme. Widget ready design and code allow you to customize your website as you desire easily. You can easily add your own logo on your website using the Author Landing Page free theme. This theme allows you easily add a custom footer credit on your website pages. With the perfect font type, size, spaces, and contrast, Author Landing Page free theme makes sure that your content is easy on the eye and your visitors enjoy reading what you have to say. Don’t let the language barrier come between you and your website. Author Landing Page free theme supports localization so that you can use the theme in your local language. Do you use right-to-left (RTL) scripts like Arabic? Well, worry not! Author Landing Page free theme supports both LTR and RTL languages. You can write content with confidence! Want to modify some CSS effects or change color of a section? Author Landing Page free theme allows you to add CSS effects right from the customizer easily. Author Landing Page free theme comes with extensive theme documentation to help you set up your website. Just follow the step by step guidelines on the documentation and your website will be ready in no time.